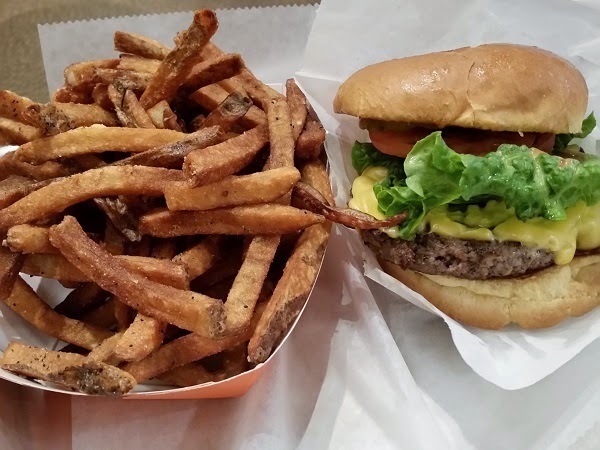 Big Al’s Gourmet Butter Burgers, Atlanta GA – Marie, Let's Eat! My friend David works a mile and a bit south of a burger place called Big Al’s, which opened at the beginning of the year, and told me that it’s so popular at his work that nobody’s having lunch anywhere else lately. One Friday in April, I figured that he’d sold me and met him at the space, which is on the ground floor of a parking-crunched two-story retail center on Peachtree, along with a Firehouse Subs and a CamiCakes. 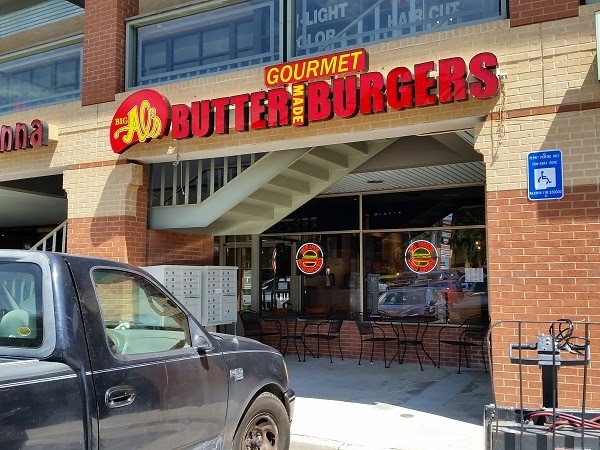 Butter burgers are a midwestern variant that use, that’s right, a heck of a lot of butter. The toasted buns get a coat of it, and the patties get a pat melted into them. They’re especially popular in Wisconsin (prompting a burger named after the state on the Steak ‘n Shake chain’s menu), but Al himself is apparently from New York. A lunch here isn’t cheap; they give you way, way too many fries for your three bucks, and so, after a seven-dollar sandwich, you’ll definitely want a glass of water and not more calories. Al stays open very late to catch the late-night revelers coming home after the Buckhead bars close. The space is small and the pumping electronic music is disagreeably loud, but the employees are really nice and the burgers are indeed really good. I’ve said before that I was a little underwhelmed with the Shake Shack up the road, finding that they were good, but didn’t live up to the hype. These did. There are better in town, but probably not in Buckhead. You’ll want a salad for a couple of meals after having one of these, mind. Wow, a lot of butter makes your burger really tasty, but it’s not at all good for you! Posted on June 10, 2015 August 21, 2017 by Grant G.Posted in atlanta, burgers, georgiaTagged atlanta, brookwood hills, burgers, georgia.